The Corbyn Phenomenon which has taken the political world by surprise, was inevitable as the political pendulum began to swing back again. Were it not for the insular bubble of Westminster, and the staged party conferences, feedback from the ordinary people and grassroots in the party, would have been heard, and listened to. This welcome change in the selection process, following a defeat in May has opened up an honest and open debate which should have been heard long ago. Had politicians listened, they would realise the urgency by which people want a change, from a Labour Party which has become entrenched not in the Left or Centre-Left but on the Right. The time is long overdue. Cllr. Lesley Brennan, (East End Ward, Dundee City Council) explains why she is giving her support to Jeremy Corbyn in his campaign to become the next Leader of the Labour Party. Over the last month, I have been truly gobsmacked by the some of the assertions made relating to Jeremy Corbyn and his supporters, particularly the hysteria of the last week. 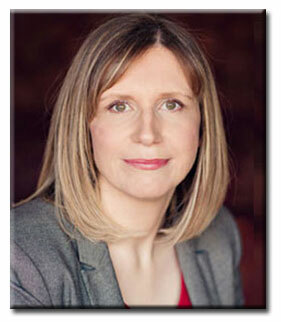 I am a Labour councillor in Dundee and an economist. In the 2010 leadership election, I supported Andy Burnham; however, I now believe Jeremy has the vision and characteristics that a majority of the electorate will vote for. I worked in academia before entering the world of consultancy. I consider myself as neither ‘hard left’ nor a moron. I have been reflecting and questioning my values and decision to vote for Jeremy, given the furore. Anyway, I was curious to explore these assertions. I have jotted down my thoughts and findings, but as the piece became longer and longer, I decided to split it. So, here’s Part I.
Jeremy’s detractors – chiefly Blairites and obviously Blair himself – have stated that if he wins, the Labour Party is destined to electoral failure in 2020. Psychologists recognise that a ‘fear appeal’ is a persuasive message that aims to arouse fear in order to promote self-protection action (Maddux and Rogers, 1983). So, claims that Jeremy Corbyn is a ‘hard-left’ candidate; his supporters are ‘morons’; the Party under his leadership will never a general election; and ‘there are the three mainstream candidates and Jeremy’ are all stated to cause alarm and fear, in order to persuade undecided members and registered supporters not to vote for him. Fear has two dimensions: perceived likelihood of the threat and the expected level of harm associated with the threat (ibid.). In this situation, the perceived threat is a Labour Party with Jeremy Corbyn as leader will not win the 2020 general election, and the expected level of harm associated with this is another five years of a Tory government. I am supporting Jeremy because I consider his leadership and policies to be attractive to a broad range of voters, and he has the best chance to win in 2020. With respect to the latter point, the new Tory majority government has clearly signalled its intention to reduce the size of the state, and, continued agenda of penalising children whose parents and carers earn low incomes, or that cannot find or unable to work. This harm is not simply perceived, it is real. This harm is causing anger and discontent. This harm was not sufficiently recognised by the Parliamentary Labour Party which has caused further anger according to analysis of social media data. In the presence of anger, fear is suppressed (Goodwin, Jasper & Polletta, 2009). But more importantly, the reality is that for many Labour members and supporters, there is no fear associated with a Jeremy Corbyn leadership, as there is a hunger for transformational change within the Party. There is a significant number of members that question the relevance of a democratic socialist party that does not robustly challenge economic injustices, such as the Welfare Bill. The Labour Party is – and always has been – a wide coalition of viewpoints that want a socially just society through cooperation and fellowship. The tensions arise within the Party regarding the route to the prize given the diversity of views and experiences. However, the tensions have existed since the Party was formed (Miliband, 1983). In 1993, John Smith spoke of the sniping by ‘parliamentary prima donnas’ (Stuart, 2005:307); thus, comments from disagreeing MPs, ex-MPs and former advisors are not new. Tolerance and diversity are essential for a healthy party. The Labour Party has evolved and adapted as society has. The transformations in the 1990s were not easy. Having lost four consecutive general elections, the majority of members wanted to avoid a fifth defeat even ‘if that meant pandering to right wing attitudes’ (Fyfe, 2014: 117). The members on the centre and left of the Party reluctantly accepted what was deemed necessary to win in order to implement Labour policies. Whilst many commentators and followers of Blair state the shift to the right was necessary to secure the 1997 election, the re-positioning may have helped the Party to gain the massive majority but perhaps, it may not have been necessary. The outgoing Conservative government had, after all, been the most unpopular government in the history of opinion polling in Britain and it entered the election still in the electoral doldrums (Norris 1997). New Labour vacated the ‘left of centre position of British politics, and occupied a political vacuum on the right of centre …, [but] it didn’t fill that vacuum with any defining ideology’ (Stuart, 2005:411). Thus, many people now ask, what does the current Labour Party stand for? My understanding of the revitalized Labour Party under Jeremy’s leadership aims to follow the form Miliband (1983:107) outlined ‘is above all concerned with the advancement of concrete demands of immediate advantage to the working class and organised labour: wages and conditions of work; trade-union rights; the better provision of services and benefits in the field of health, education, housing, transport, family allowances, unemployment benefits, pensions and so on’, which is ‘bound by the capitalist environment’. Thus, this vision is not ‘hard-left’ but to the centre of the traditional Labour Party. I agree with Luke Akehurst’s assertion, “Any centre-left party not anchored in the working class and its interests via the union link is about as much long-term use as a chocolate teapot” (2012). But I do not agree with Akehurst’s recent statement that Jeremy “represents the most serious threat of a Hard Left victory”, an analysis of Jeremy’s economic plan demonstrates he is not ‘hard left’ but in the centre ground. The 1983 result for the Labour Party was a disaster due to a number of reasons. The key factors in order of importance were: the perception that the Tories were competent running the economy ‘played a highly significant role in determining the outcome of the election’ (Whiteley, 1984); Thatcher’s ‘Falklands factor’ (Sanders et al, 1987); the growth of consumerism and individualism (Miliband, 1983); bitter infighting within Labour Party even after the SDP split (Morgan, 1987); and, the Party was perceived as being out of step with the public, for example selling off council properties to tenants with a large discount. The 1983 Manifesto stated a Labour government would repeal policy but it was a popular policy with tenants (King, 2010:106), especially as the Tory government was forcing up rents rapidly. Also, the Labour Party was perceived as being too left of centre (Castles & Mair, 1984). The UK has radically changed since 1983: owner occupation is the dominate tenure whereas in 1983 most folk rented from either their council or Scottish Special Housing Association (Scottish Government, 2011); financial liberalisation has led to high levels of personal debt (Barba & Pivetti,2009); the labour market is very flexible for employers and insecure for workers, which is characterised by zero hour contracts and low pay (Brinkley, 2013); many young people, who enter university leave with tens of thousands of debt and weak job opportunities (Bachan, 2014); universities are being hollowed-out and losing their social role (Cribb & Gewirtz, 2013); and, the pinnacle of the neoliberal restructuring: the major privatisations programmes, including those of airports, steel, water, electricity, coal and the railways (Parker, 2013). So, the UK is structurally different as is the Labour Party. There are however lessons that ought to be learned: the need to be perceived as economically competent; be loyal and supportive of the leader; and, occupy a broad political space to have sufficient appeal to attract enough voters to win. Jeremy’s plan An Economy for 2020 is economically credible and has broad appeal as across the political spectrum people support the public ownership of energy companies and transport (YouGov, 2013). The only definites regarding previous elections are the outcomes and the turnout. The reasons for the success or defeat are challenged, as are the reasons for turnout. But everyone can agree that the turnout in Scotland in May returned to the 1997 level, as figure 1 depicts. 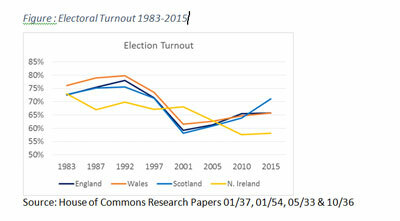 Elsewhere in the UK, turnout was between 8% and 15% less than the 1997 level. People in Scotland were strongly motivated to vote. Unfortunately, the majority did not vote for the Labour Party. The Scottish Labour Party lost 18% of its vote share (BBC, 2015). Thus, given the scale of the challenge ahead, a structural shift in policy is needed to overcome downward trend in electoral success. Similarly, some suggest the lower turnout in 1997 and 2001 was because relatively few saw important policy differences between the parties (Pattie & Johnston, 2001). So, the Labour Party needs a distinct inspiring vision to give people a reason to vote Labour. Jeremy’s plan is creating a real buzz and excitement about the Labour Party. Fractured Facts III: Jeremy Corbyn is hard left. Political parties – and importantly their perceived political position – shift over time along the left-right spectrum within certain accepted parameters dependent on a number of factors. Simply put, the ‘hard left’ world, the government is responsible for everything and people are reliant on the state for everything, and, in the ‘hard right’, individuals are completely self-reliant. Being a trained economist, I view the world through a market framework not through these loaded terms. So, the extremes of the political spectrum are: a command economy where the government owns, plans and delivers everything, and capitalism where the free markets dominate economy with a very little government involvement except perhaps to ensure property rights are enforced. Mainstream politics in the UK operates in the centre ground: ensuring merit and public goods are provided, such as health, education, social services, roads and street lighting; and intervening when markets fail (e.g. housing market not providing affordable accommodation, labour market not providing enough work, and, environmental degradation). I consider political debates ought to be centred on when and how to intervene in failing markets; how much merit and public goods ought to be provided; and, how to fund these. Jeremy Corbyn is addressing these core centre-ground issues with a sensible credible plan. Thus, it is nonsense to suggest Jeremy’s leadership is ‘hard left’. The evidence indicates that the fear appeals are simply tactics from his opponents’ supporters; Jeremy Corbyn is not aiming to restructure the UK into a command economy; comparisons with the 1983 election are spurious but there are lessons to be learned; if you give people a reason to vote they will; and, Jeremy Corbyn is not ‘hard left’. In part 2, I analyse where we are as a Party and how we arrived here, and moving forward. Akehurst, L. (2012) Labour vs the SDP: 31 years on – who was right? LabourList 26/03/2012 Accessed online at http://labourlist.org/2012/03/labour-vs-the-sdp-31-years-on-who-was-right/ on 27 July 2015. Bachan, R. (2014). Students’ expectations of debt in UK higher education. Studies in Higher Education, 39(5), 848-873. Barba, A., & Pivetti, M. (2009) Rising household debt: Its causes and macroeconomic implications—a long-period analysis. Cambridge Journal of Economics, 33(1), 113-137. BBC (2015) Election 2015: Scotland. Accessed online at http://www.bbc.co.uk/news/election/2015/results/scotland on 27 July 2015. Brinkley, I. (2013). Flexibility or insecurity? Exploring the rise in zero hours contracts. The Work Foundation, London. Castles, F. G., & Mair, P. (1984) Left–right political scales: Some ‘expert’judgments. European Journal of Political Research, 12(1), 73-88. Cribb, A., & Gewirtz, S. (2013). The hollowed-out university? A critical analysis of changing institutional and academic norms in UK higher education. Discourse: Studies in the Cultural Politics of Education, 34(3), 338-350. Goodwin, J., Jasper, J. M., & Polletta, F. (Eds.). (2009) Passionate politics: Emotions and social movements. University of Chicago Press. Keller, H. (1903) Optimism: An essay. P.68. Accessed online at http://www.gutenberg.org/files/31622/31622-h/31622-h.htm#Page_53 on 27 May 2014. King, P. (2010) Housing Policy Transformed: The right to buy and the desire to own. Policy Press. Miliband, R. (1983) Socialist advance in Britain. Socialist Register, 20(20). Morgan, K. O. (1987) Labour people: leaders and lieutenants, Hardie to Kinnock. Parker, D. (2013). The Official History of Privatisation, Vol. II: Popular Capitalism, 1987-97. Routledge. Sanders, D., Ward, H., Marsh, D., & Fletcher, T. (1987) Government popularity and the Falklands War: a reassessment. British Journal of Political Science, 17(03), 281-313. Shaw, E. (2002) The Labour party since 1979: Crisis and transformation. Routledge. Stuart, M. (2005) John Smith: a life. Methuen Pub Ltd.
YouGov (2013) Nationalise Energy and Rail Companies, Say Public. Accessed online at http://yougov.co.uk/news/2013/11/04/nationalise-energy-and-rail-companies-say-public/ on 27 May 2014. This entry was posted in Austerity, Democracy, Economics, Employment, Globalisation, Government policy, Party Organisation, Policy Documentation, Privatisation, Topical News, Uncategorized, Unions and Political Activism and tagged democracy, Jeremy Corbyn, Labour Leadership, Labour Party, Lesley Brennan by adminthinkleft. Bookmark the permalink. Fantastic account, Lesley. Thanks for sharing. This detailed and convincing argument addresses the myths we are hearing as people come to terms with politcial change. The genie is well and truly out of the bottle. The regret is that it has taken so long. Thankyou. And how have Scottish Labour voters, who voted Yes in September 2014 and then defected to the SNP in May 2015, reacted to Corbyn’s contention that devolution has gone too far? “Corbyn told the Guardian he would oppose Sturgeon’s call for the UK government to hand powers over business taxes to the Scottish parliament, as that would allow the SNP to cut corporation tax to compete with England’s rates. The Scottish parliament will be able to set its own income tax rates from April 2016 and is taking control over air passenger duty – a levy the SNP plans to cut by at least 50%. Corbyn insisted that raising business taxes at UK level would be a crucial tool in increasing public spending. Confirming that he would expect a future Labour administration in Edinburgh to keep any Scottish income tax rates closely pegged to the UK rates, Corbyn set out a firmly pro-UK financial agenda. “I do think that there has to be a UK sharing of resources and a UK-wide policy, certainly on corporation tax and if there’s a huge difference between other taxation levels between different parts of the UK then that’s a recipe for economic imbalance,” he said. Well argued Lesley. Some of ur points will come in useful when I’m phone canvassing for Jeremy.